This entry was posted on May 21, 2017 by admin. WindRestrictor® is a company based on the modification of your finer vehicles. Naturally, we try to keep up on the current trends, and I for one have long been a fan of tuners, and more specifically the import scene. 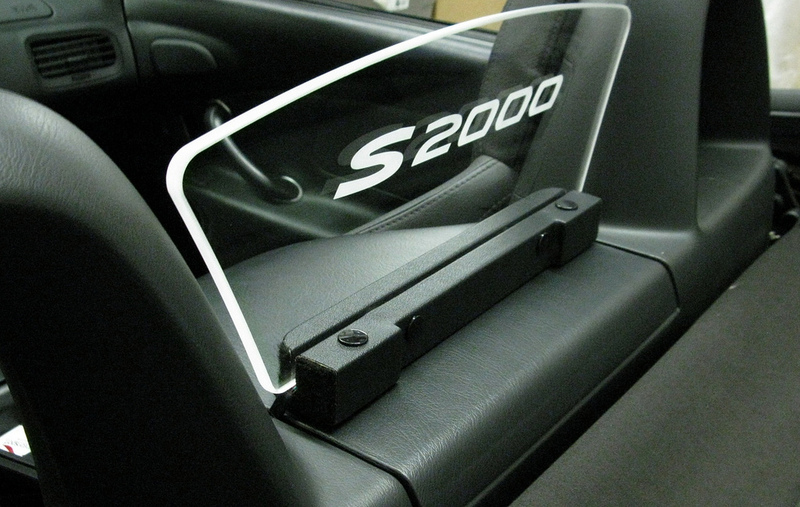 We do make wind blockers/wind deflectors for two of the most popular tuned imports around, Honda S2000s and Miatas. I'd like to take some time to talk about the Miata and the Honda S2000's history and the history of import tuners in general. Tuners have become increasingly popular due to the film franchise, " The Fast and the Furious". This movie franchise has been one of the highest grossing franchises in the history of motion pictures. With a worldwide gross of over five billion dollars. But, tuners have been around a long time before this or any move franchise. Car modding itself became heavy in the USA in the 1950s and 1960s. Drag racing hot rods was a popular past time. Making them faster and cooler grew to be just as popular. They were running quarter-miles in Southern California. How many cool things came out of California? Its almost not fair! Years later, in the same region, Japanese vehicles started gaining in popularity. Hondas, Mazdas, Toyotas, and Datsuns (later Nissans) were all the rage. Young Asian-Americans led the street racing charge and the popularity was spreading throughout the region. The same as the 1950s, more and more drivers were modifying their cars for an edge in the high speed racing. Later, cosmetic changes as well. Things like eccentric paint jobs and hood scoops became more and more common. The vehicles started looking like something out of a science fiction movie. Forget race cars, they started looking like spaceships. American racing crews started popping up as the fever spread. As did pink-slip racing and crews getting into physical altercations. Whenever you have speed and testosterone present, things can tend to get wild. The mainstream started catching on and pretty soon tuned out imports were appearing in television and movies. The craze was official when in 1995 a Manga series popped up that later developed into anime called Initial D. The Japanese who manufactured the cars that started the craze, took notice and paid homage in an original Japanese form of art. The circle from Asia to North America went back overseas. Naturally, American and Japanese companies started making accessories for this booming community. WindRestrictor® saw the rapid expansion and decided we'd produce models for the two of the most famous tuner cars. The Honda S2000 and the Mazda Miata. Honda has long been a leader in the auto, motorcycle, and recreational vehicle industry in the United States. Their Goldwing cycle is a brisk seller world wide, as are their CR-V SUVs and the Civic. As you can probably imagine, such a popular brand certainly has its hand in the burgeoning tuner end of the automotive industry. Honda's famous roadster had a ten year run from 1999 until 2009. It was first shown as a concept car at the world famous Toyko Auto Show in 1995. Many variation appeared at several auto shows for years to come. The S2K was finally officially launched on the 50th anniversary of Honda. 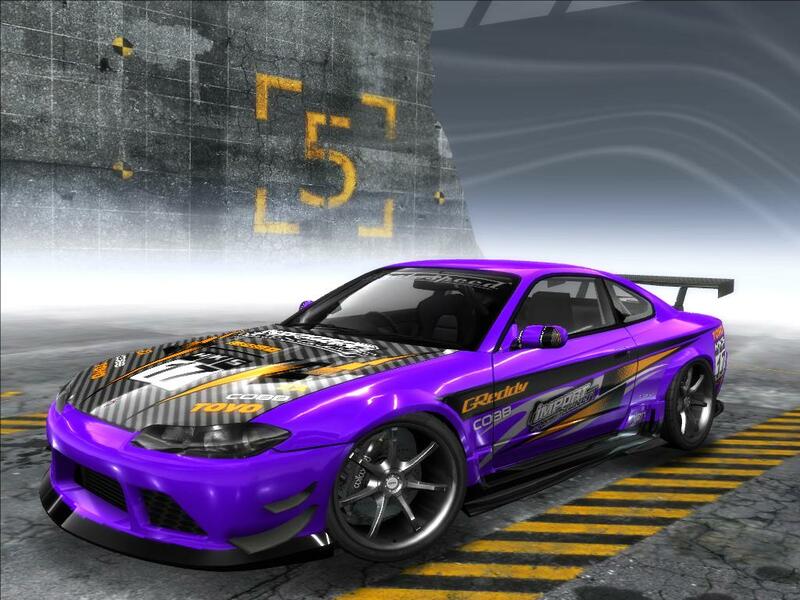 It went through several variations during its run, and was heavily modded out almost immediately by the tuner community. Japanese racers liked the sleek design and the horsepower packed into such a small compact frame. The dollars per horsepower ratio is very hard to match. Like many models, the automotive crisis put an end to production of this one-of-a-kind roadster. However, there's still many on the road. Tricked out and fast as hell. Suffice it to say, the S2000 is a classic tuner car. A combination of speed and looks that'll be hard to replicaate in the future. If we're talking about classic imported roadsters ready for tuning, the Mazda Miata (aka the Mx5) need to be in any conversation. Still in production today, you can't find many vehicles with the cult following of this imported classic. Miata fans are rabid and LOVE to modify their vehicle. I've personally seen a cow spotted Mx5 with a made-to-order license plate that said, "MOOATA". The tuner community is no exception to the rabid rule either. They turn Miatas into jets from the future in look and performance. The Miata was first produced in 1989. The name MX5 literally means Mazda Experiment 5. Designed at a time when roadsters were starting to go the way of the dinosaur, this light-bodied reasonably priced convertible was a major hit from its debut. Now four generations in, you see still several on the road or at the midnight races. Production has slowed down from its peak but overall one million plus Miatas have been sold during its nearly thirty year history. Making it one of the most sold car models in all of history. A very prestigious accomplishment for a vehicle considered to be an experiment. Do you have one of the many tuners not listed here? No, problem. We realize there's many more than two kinds of tuners on the road. We now have a Universal Glowplate that fits several types of cars. 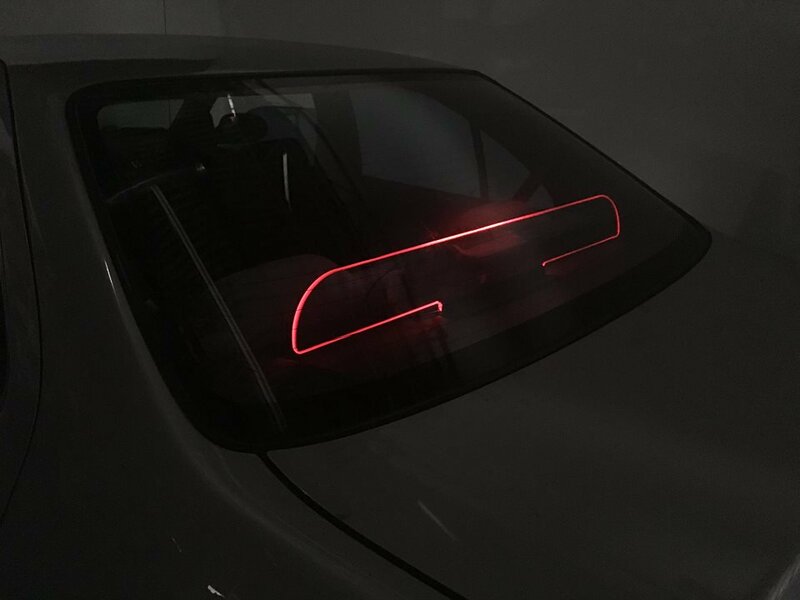 Customizable to your specifications, you can etch the name of your team, group, or car model and have it shine through the night from your window. 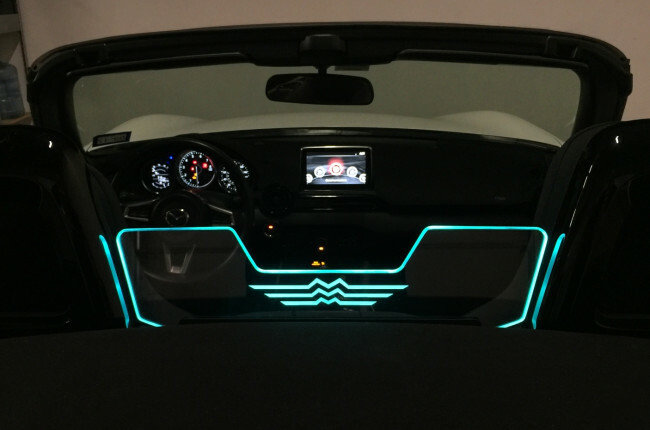 If just a Glowplate wasn't enough, get a matching set of Illuminated Door Sills (full personalization available here too) to finish off the look. But, we don't stop there! We also have Illuminated Wheel Rings AND Puddle Lights. We're ready to serve you with more options than ever before! A big thank you to everyone who as been following our blog posts. If you have any additions, corrections, additional facts, or just want to say hello, please email me! Paul@windrestrictor.com is my email address and don't hesitate to hit me up! Interested in our products? Click here to order and save 5% using the code Paul5.